Where previously there was none, a flower blooms, a fruit suspends itself from the branch of a tree, and this is what we see: round, starburst thing. Velvet petals and smooth, rosy skin. Shape and matter, weight when we lift it between our own curious palms. Where did it come from? That might well have been Joseph's question as Mary swelled in front of him, soft and glowing with a future for which she'd never asked, and in which, Joseph held no physical stake. We now know all about fertilization: pollen grips stigma, sperm penetrates egg. Though it happens in the red-shadowed darkness, conception is not magic, either in flora or fauna. Unlikely to the point of miraculousness in its overwhelming repetition the world over, certainly, but not magic. Yet, in those early days of prophets and shepherds, the spontaneous fire of life in the womb of his betrothed must have stymied Joseph. And what of Mary? A child herself in both age and stature, limited by social constructs and by her religion to a small geography and an abbreviated list of choices, most of life's mysteries likely seemed magical to Mary. Were the conception of her child not, in fact, immaculate, it is equally doubtful either that she consented to a lying down in the dark with a man not her betrothed, or that she understood the consequences of such actions. Whatever the case, a blastocyst implanted itself in the ripened lining of Mary's uterus early in the spring of a year that would be zero. Was it the product of egg-meeting-sperm? Or egg-alone plus a tadpole-sized dose of the Holy Spirit? And does this matter? I don't think it has ever occurred to me just how much of the nativity story is presented to us through the eyes of those lying down in the dark. The Spirit of the Lord came upon the young virgin, heralded by an angel in a dream. When a jilted, disbelieving Joseph determined to break his engagement to Mary, the angel of the Lord appeared to him, too. Mary gave birth at night in a barn and lay her swaddled child in a darkened manger, surrounded by the smells of animals--their food, their sweat, their waste. Shepherds reclining in the grass on the hills outside Bethlehem responded to the appearance in the night sky of an angel, saying to them, Do not be afraid. I bring you good tidings of great joy. Night is a time of lovers, of secrets and lies, of dreams and mysticism, of vulnerability as you lie prostrate beneath blankets and close your eyes. Your human functionality is limited to a heartbeat and the instinctive swell-collapse of lungs. And sometimes the subconscious sparking of a mind conjuring angels. For young Mary, restless with the tumbling, kicking person-of-God in her womb, I imagine there were a number of nights spent up and wandering. Hoping that the man she intended to marry would stand by her. Which he did, being a faithful man, both of God and of the heart. Was it an easy decision? Once the angel of the Lord had appeared to him and said, Joseph son of David, do not be afraid to take Mary home as your wife, because what is conceived in her is from the Holy Spirit. Perhaps Joseph rose from his bed after this dream and wandered out of the house in the moonlight and came upon Mary, standing at the fence looking over her family's pastureland. Perhaps he reached out his hand to her, and she took it, and pulled him forward, and placed his palm on the rise of her stomach under layers of robes and tunic. Joined this way they may have felt the child pirouette in utero , reminding them of the rest of the prophesy. I envy them at least some of their knowledge. 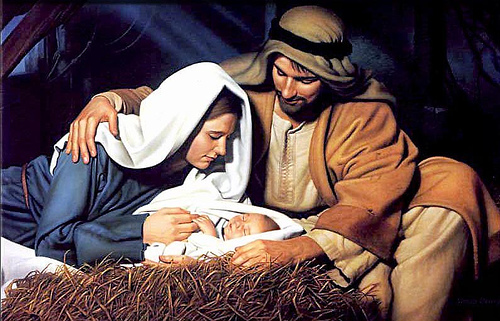 Thousands of years before technology would allow the rest of us mortals to know such things ahead of time, Joseph and Mary knew she would give birth to a son. They knew they would name him Jesus. They knew he would save his people from their sins. All parents have tremendous hope for their children: health, curiosity, dexterous hands and an easy time making friends. But the salvation of mankind was an expectation particular to Joseph and Mary. In those days, Caesar Augustus wanted to count the people over whom he ruled, and so he called for a census of the entire Roman world. Every man was required to return to his own town to register. Joseph and his soon-to-be wife--then heavy with child--prepared to travel from Nazareth to Galilee. We've seen artists' renderings of this pilgrimage: Mary, usually wearing blue, side-saddle on a sway-backed donkey. Joseph holding the bridle and facing a future already written. We've read about their arrival in the little town of Bethlehem, finding every room full to bursting with other census-fulfilling migrants. Every door closed to them. Exhausted and hungry. Hot, shuddering early pains of labor making Mary double over. How beautiful a barn stall must have looked to them that night, empty and welcoming. Mary paced in ever-shrinking circles, breathing through the clenching in her belly. She sank her fingers into the curly coat of a lamb, scratched the chin of a lowing cow in the adjoining stable, then squatted in the dust and cried out. Was it Joseph's name she called? Or maybe she screamed the Lord's name and swung her hands fruitlessly in the dark, hoping the spirit who'd rendered her this low would ease her suffering. But childbirth is childbirth for any daughter of Eve. What we do know is that it was Joseph's hand that caught onto her; Joseph's arms that carried her to the soft-swept bed of hay and sack cloths he'd assembled in a corner; Joseph's voice that coaxed and championed her through wave after wave of blinding pain; Joseph who knelt and pulled the slick, crumpled boy child from between her legs. Jesus drew his first mortal breath and let out a bloody, finite, human wail. He was placed on the chest of his mother, and settled at the sound of the familiar thrum of her heartbeat. Suddenly parents, Joseph and Mary must have felt as naked as Christ had come. They must have known the dangers. Jesus had been born into a time of paranoid kings. He was marked for a life building immediately and inevitably toward sacrifice. They would bury him. Yet, Joseph warmed water over a fire for washing, and Mary urged the baby to root for her breast. These small, capable movements were their offerings. Later would come the shepherds and the Magi. Expensive gifts would be offered at the Christ child's feet. And centuries of painters capturing this moment for posterity would insert a simple, glowing halo above the head of the babe in the manger. But there was no halo, and we know that because a halo would have proven everything Jesus said or did for the next thirty-odd years. He was a clutching, yearning, hungry, tired, mewling bundle of humanness in those first hours of life in a Bethlehem barn. And Mary and Joseph, going through the motions of new parents for the first time, were giving him the greatest gift of all. Unconditional love. Unquestioning love. Unwavering love. All that the boy was prophesied to embody as a man suspended from a cross, paying for the sins of the world. That's what they gave. Something utterly human, and at the same time, spectacularly divine. Where previously there was none, a flower blooms. The Hazelnut. Even the science of her conception and beginning cannot dim the miracle. She is imminent. She is full of seeds. She will require a great deal of tending and nurturing. It has been the same for many thousands of years. All that we will give can be broken down into simple, menial movements. But as a whole, parenting will also be the finest, most valuable gift we have ever had the opportunity to give to anyone. This telling of the Nativity Story was my Advent gift to Jonathan. Merry Christmas, dear readers!